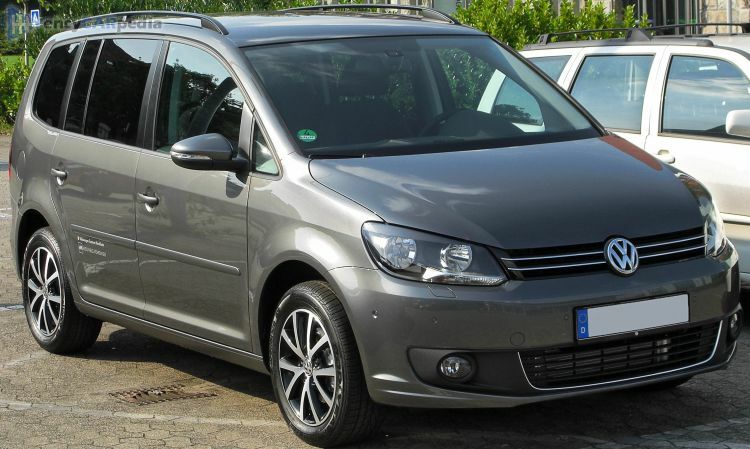 This Volkswagen Touran 1.4 TSI 140 was produced from 2010 to 2015. It is part of the Typ 1T generation Touran. It replaced the 2006 Volkswagen Touran 1.4 TSI 140 and was itself replaced in 2015 by the 2015 Volkswagen Touran 1.4 TSI. It's a front-wheel drive front-engined compact MPV with 5 doors & 5-7 seats. With 138 hp, the turbocharged 1.4 Litre 16v Inline 4 petrol engine accelerates this Touran 1.4 TSI 140 to 62 mph in 9.5 seconds and on to a maximum speed of 126 mph. Having a kerb weight of 1516 kg, it achieves 41.5 mpg on average and can travel 547 miles before requiring a refill of its 60 litre capacity fuel tank. It comes with a choice of either a 6 speed manual gearbox or a 7 speed automatic gearbox. Luggage space is 695 litres, but can be expanded to 1989 litres for larger loads.